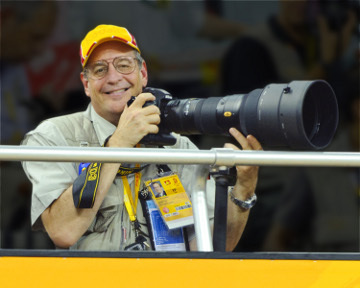 At home on the sidelines, research lab, boardroom or machine shop, Richard Mackson is an award-winning sports photographer, inventor and entrepreneur whose career has spanned nearly forty-five years, and taken him around the globe. His professional career began at age sixteen at the Santa Monica Evening Outlook, covering general news and sports. At age nineteen, he started a continuous relationship with Sports Illustrated, and was under contract to them for twenty years. He's covered everything from archery to yachting and all sports in between. His work has appeared in Time Magazine, People Magazine, Newsweek, National Geographic publications, Volleyball Magazine, NFL publications, and countless other books, magazines and newspapers, in print and digital editions. His photos have appeared on dozens of covers of Sports Illustrated magazines, and he has photographed World Cup Soccer, America’s Cup Yachting, fourteen Olympic Games, Rose Bowls, the Oscars, Kentucky Derbies, NCAA Final Fours, BCS/CFP Championships, NBA Finals, over thirty Super Bowls, Stanley Cups, World Championship Boxing, and countless other national and international sporting events. Photo District News named one of his pictures from the 1991 World Series one of the 100 best “Sports Shots of the Century.” He considers photographing Backgammon and Turtle Racing to be his most challenging assignments. A licensed pilot, Mackson was one of the aerial photographers in a helicopter chasing O. J. Simpson down the freeways of Southern California during the infamous “Slow Speed Chase.” He was also one of the pool photographers granted courtroom access and, ever the inventor, helped build the remote camera system that photographed the subsequent O.J. Simpson criminal trial. As a young entrepreneur Richard founded and ran Westside Processing, Inc., a highly successful photo-processing lab in Santa Monica, California for over twenty years. He was the CEO of the business, and also invented and patented many of the photo processing machines for the lab. Prior to the days of the Internet, moving images and information was a logistical nightmare. In 1980, with only one day’s notice, Richard designed, built, and operated a “flying photo lab” on-board a Lear Jet for Time Magazine to process the color film of Ronald Reagan the night he won the Presidential election. This later led to his groundbreaking work in digital photography workflow by conceptualizing, defining and helping construct the first remote editing and digital transmission system in 1987 for Sports Illustrated. In the early 1990’s he approached Eastman Kodak with a revolutionary idea to re-engineer the venerated Kodachrome film developing process. Many at Kodak said it simply couldn't be done, and despite numerous rebuffs at his overtures eventually his work led to the creation of the K-Lab process. “Many thought Richard was nuts but he not only proved to everyone he was, but also that he was absolutely correct in his approach to solving what were assumed to be insurmountable problems, creating a technological masterpiece,” according to Kodak's Dr. Robert Cappel. In 1996 then Kodak CEO George Fisher asked Richard to join Kodak, where he was given the challenge to be an “Agent of Change,” a role with an open ended definition in which he worked for thirteen years. Richard started at Kodak in 1996 and retired in 2009. While at Kodak, he still was an active sports photographer, but the majority of his time was dedicated to helping Kodak transform itself into a digital imaging company. While at Kodak he helped craft strategy, created intellectual property, defined new business opportunities and helped bring a vast range of new products to market, spanning traditional films to digital products. “His greatest strength is the unique ability to network across all levels of the organization and get people working together,” according to Phil Faraci, Kodak's former President. Richard holds numerous patents both inside and outside of Kodak, and while at Kodak, rose to the position of Vice President and Director of External Relations, Office of the Chief Technical Officer. He had the responsibility of directing the Technology Analysis, Intellectual Technology, Standards, and Communications groups at Kodak. One of Richard’s key business innovations in 2004 was his creation of the ‘R Team' that was an internal consultancy group unique within the corporate world. Richard fostered an environment where the CEO, President and Chief Technical Officer were equal members of a team of “free thinkers” who envisioned the digital world we are in today. “My years at Kodak, as a business owner/CEO, and contract photographer for Sports Illustrated were unique,” Richard says. Today he consults on several projects in the areas of digital workflow, IT infrastructure, large-venue WiFi and DAS systems. Additionally, after leaving Kodak, Richard successfully went back to his roots as a sports photographer for USA TODAY Sports Images where he is now Senior Contributing Photographer and Technology Consultant. As an inventor working on new gadgets and methods to innovate both the capture and movement of digital images and information, Richard enjoys consulting on projects that interest him and can benefit from his unique perspective and expertise. Keeping with the philosophy of giving something back, in 1984 Richard was asked to step away from his day to day work as a photographer and was appointed the Director of Photographic Operations for the Los Angeles Olympic Organizing Committee. Today he serves as a technology consultant to the Rose Bowl Stadium, and is the Photographic and Digital Media coordinator for the College Football Playoff, the Rose Bowl Game, and the Big-10 and Pac-12 Championships. He is also the Coordinator of the Southern California Large Venue IT Managers Group, and Technology Consultant to the Breeder's Cup. Richard is also the CEO of two companies: RGM Synovations LLC, which focuses on business and technology innovation; and JLR Ventures, Inc., a real estate company. In 2013, he sold a JLR Ventures project, a major renovation of an upscale lakefront residence in New York State’s Finger Lakes region. Richard led a team that designed and built the residence, often building much of the project himself hands-on, and provided most of the technological and construction innovation for the project, resulting in a unique, high-tech Smart Home. Richard is a long time member of the American Society of Media Photographers, and the National Press Photographers Association. He is also a member of the Press Photographers Association of Greater Los Angeles, and in 2017 was awarded a Lifetime Achievement Award from that association for his contributions to the world of photography. In 2005, he was inducted into his Santa Monica High School’s Hall of Fame, where he graduated in 1972. He holds a Bachelor of Arts degree in Industrial Arts Education from California State University, Long Beach, and is also a frequent and enthusiastic speaker and lecturer on photography, technology and business strategy topics. Today Richard resides in Santa Monica, California with his wife Joy and their daughter Lauren.